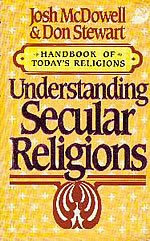 The articles on secular religions from “Understanding Secular Religions” by Josh McDowell and Don Stewart are part of the interim curriculum. We have prepared these study guides which you can use in two ways: (1) Read the study guide first so you can have an overview of the article; and (2) After reading the article, try answering the study guide questions to test your comprehension. Online, interactive quizzes on terms and definitions from world religions with automatic scoring are also available. Why should atheism, agnosticism, and skepticism be regarded as religions? How do William and Mabel Sahakian differentiate between an agnostic and an atheist? How does Bishop Charles Gore summarize atheistic belief? What are the two basic kinds of atheists according to Plato? How is agnosticism defined by William and Mabel Sahakian, the Runes Dictionary of Philosophy, and Peter Angeles’ Dictionary of Philosophy? What are the two types of agnostics according to William and Mabel Sahakian and Christian authors Norman Geisler and Paul Feinberg? What is skepticism according to the Runes’ Dictionary of Philosophy and Peter Angeles? How does Warren Young differentiate between skepticism and agnosticism? What were the different schools of Skepticism and their respective beliefs? Who were the “mitigated skeptics” and what did they believe in? Who was Rene Descartes and how did he view skepticism? Who were David Hume and Albert Camus? What were their thoughts about skepticism? Who was Niccolo Machiavelli and how was his social ethic related to atheism? Who were Georg W. F. Hegel, Ludwig Feuerbach, Auguste Comte, Friedrich Nietzsche, Karl Jaspers, Martin Heidegger and Jean-Paul Sartre? How did they influence atheistic thought? Who were David Hume, Immanuel Kant and T. H. Huxley? What were their contributions to agnosticism? The five types of arguments most non-theists use against the existence of God are languages, knowledge, moral concepts, scientific methods, and logic. Summarize each and then give a Christian refutation of each. “Marxism, and its descendant, modern communism, presents a strong challenge to Christianity.” Explain. What is the impact and influence of Marxism based on Vincent P. Miceli’s observation in 1971? What is the quasi-religious nature of Marxism according to Encyclopedia Britannica? According to Thomas Kay, why can’t Christians remain silent about or, worse, embrace Marxism? Give some background information about Karl Marx. How did he come to write Das Kapital? What was Marx’s view of philosophy? Give some background information about Georg Wilhelm Hegel. How did Marx’s view Hegel’s process of dialectics? What did Marx reject about Hegel’s dialectics? Who was Ludwig Feuerbach and how did he chape Marx’s ideas about religion? How did Marx modify Feuerbach’s ideas? How does William S. Sahakian summarize Marx’s attitude toward religion? “Marx saw two compelling reasons to abolish religion and promote atheism”. What are these reasons? How have some people tried to synthesize Marxism and Christianity? Who was Douglas Hyde and how did he become involved with Marxism? What caused his disillusionment with Marxism, as narrated in his book “I Believed”? Why does “absolute materialism lead to a form of practical totalitarianism” according to Thomas O. Kay? What is the “distinction between the goal and plan of Marxism and the goal and plan of Christianity”? “True freedom for mankind is possible only when the individual is considered valuable and when the root causes of injustice are removed.” Explain based on Miceli’s opinion. Give a general critique of Marxism. How is Marxism inadequate to meet men’s needs according to Michael Albert and Robin Hahnel, and Douglas Hyde. How can secular humanism be defined based on the ancient Greek philosopher Protagoras? How does Peter Angeles in his “Dictionary of Philosophy” define philosophical humanism? Give a historical perspective of the modern secular humanism. What are the prominent secular humanist organizations? What is the Humanist Manifesto I? What are its 15 major themes or convictions? What is Humanist Manifesto II? How did World War II influence the need for a new manifesto? How is it different from Humanist Manifesto I? The 17 propositions of Humanist Manifesto II can be categorized into six groups: Religion, Philosophy, Mankind, Society, One-World Government, and Science. Give a short summary and a critique of each group. “Two of the most basic presuppositions of secular humanism are relative morals and the basic goodness of mankind”. How do you refute these presuppositions? Why is existentialism difficult to define according to philosopher Walter Kaufmann? How do William and Mabel Sahakian describe existentialism? I. M. Bochenski, in his book “European Phi1osophy” relates six of the common existential themes. What are these themes? What is religious or Christian existentialism? Who was Sren Kierkegaard and why is he considered “the Father of Existentialism”? What are Kierkegaard’s main tenets according to William S. Sahakian? Why is Kierkegaard’s philosophy in opposition to that of the German philosopher Hegel? What is truth according to Kierkegaard? What is anxiety from Tillich’s existential point of view? What is Tillich’s definition of God? What is Tillich’s existential interpretation to the concept of grace? Who is Gabriel Marcel? What are his ideas according to I. M Bochenski? “Heidegger did not view himself as an existentialist!” Explain. What is Heidegger’s concept of Dasein, angst and death? Why does Sartre view life as being absurd? What are Sartre’s views about the autonomy and freedom of man? What did Sartre mean by “existence precedes essence”? According to Sartre, how could man receive his own self-fulfillment? What is forlornness according to Sartre? “Many people have embraced existentialism for a time, sincerely thinking that its view of life is accurate. However, many leave existentialism because it offers a solution, meaning, and commitment which is not truly satisfying. Even Sartre, toward the end of his life, swung very close to theistic commitment.” Explain. What is Jaspers’ philosophy according to Jean T. Wilde and William Kimmel? What are the differences between the existential philosophies of Jaspers and Sartre according to F. H. Heinemann? Why is existentialism not biblical Christianity according to philosopher Hazel Barnes? According to Bochenski, what are the philosophical problems posed but not answered by the usual existential concepts?